Tyler Farr and breakout artist Luke Combs round out the exciting lineup for the Fifth Annual Pepsi Gulf Coast Jam, it was announced by Executive Producer Rendy Lovelady on a Facebook Live event. 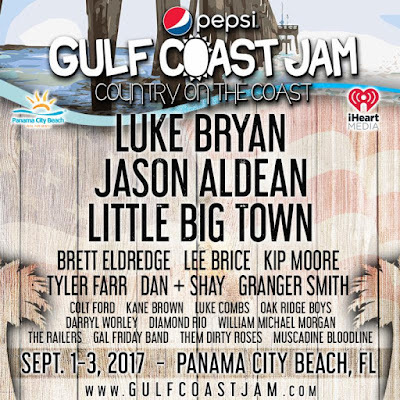 A total of 20 acts, including headliners Jason Aldean, Little Big Town and Luke Bryan, will entertain the three-day festival Labor Day Weekend, September 1-3, 2017 at Frank Brown Park in beautiful Panama City Beach, Florida. Farr is the only artist on the bill to be booked on the festival four times, but he has only hit the stage once. "Tyler put on a great show our first year in 2013, Lovelady told WPAP-FM/Panama City Beach listeners last week. "A storm moved in before his set in 2015, and we had to clear the festival grounds. Last year hurricane Hermine ruined everyone's plans, so we're excited for Tyler to play again this year!" In addition to the headliners, Brett Eldredge, Lee Brice, Kip Moore, Dan + Shay, Granger Smith, Colt Ford, Kane Brown, The Oak Ridge Boys, Darryl Worley, Diamond Rio, William Michael Morgan, The Railers, Gal Friday Band, Them Dirty Roses and Muscadine Bloodline are all scheduled to entertain during the action-packed weekend. One final lineup addition will include the winner of the Pepsi Southern Original competition. Full details regarding submissions, dates and locations can be accessed at www.hwy20ent.com. Fans are encouraged to follow Pepsi Gulf Coast Jam on Facebook, Twitter and Instagram for exclusive pop-up offers. The current offer features the opportunity for a free three-night stay (based on availability) at the luxurious Hidden Dunes Resort in Panama City Beach by liking and sharing this Facebook Live post. VIP Side Stage and Skybox tickets are already sold out, and a very limited number of VIP Golden Circle and VIP Pit Experience packages remain at $699 and $439, respectively. Three-day General Admission tickets are currently $129. Preferred Lodging Packages are available exclusively by purchasing a lodging package from one of the official Pepsi Gulf Coast Jam lodging partners and includes a condo or hotel, access to a special viewing area between General Admission and VIP sections and exclusive entry line to festival grounds. Prices vary based on accommodations. Military Tickets are available for $109, and that price will not increase. The ticket includes all General Admission benefits. Military ticket holders must hold a current or former military ID and present it at gate upon entry. Active and separated militry may purchase tickets for immediate family, and the entire group must be present and escorted by the ID holder upon entry. Special Early Entry Passes are available for $40 for one day or $75 for all three days. Early Entry gates will open at 1:30pm. An Early Entry Pass is not a ticket but allows ticket holders to enter 30 minutes early to claim a spot within their ticket section with a maximum of two chairs per pass. More information about all tickets and packages can be found here. Music will begin each day at 2:00pm, so festival goers can spend the morning taking a leisurely walk on the beach, enjoying the bright sunshine, grabbing lunch at one of Panama City Beach's wonderful restaurants or checking out other area attractions before heading to the concert grounds for an afternoon and evening of entertainment.